12 inch bladed and more Kukri Machete Knives >> These are all modern innovative large machetes (in kukri version) with steep variations in handle and blade than regulars. The handle is modernized to give an easier grip, is more durable and better looking. Even the basic shape of the kukri blade is improvised to give a contemporary look yet the durability, functionality and quality is still there in every form. Blade size ranges from 12 inch and above. 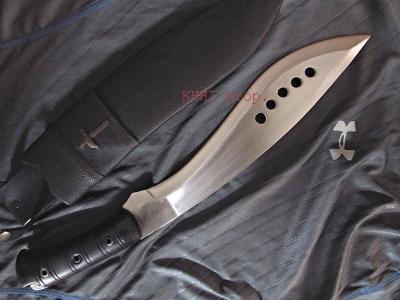 These are kukri like machete that will do a knife thing to the fullest..